More updates on DAPL and environmental justice issues follow. The North Dakota Public Service Commission is pursing a $15,000 fine against Energy Transfer Partners for failing to follow rules meant to preserve Native American artifacts, according to a story in the CBC. The Public Service Commission maintains that Energy Transfer Partners subsidiary Dakota Access LLC failed to get its approval before proceeding with construction in October on private land in southern North Dakota after the artifacts were found along the route. The company is disputing the fine, saying it was not a “willful violation” and that artifacts were not disturbed. Two quick points: First, for a $3.8 billion project, $15,000 is something like a parking ticket. It is not much of a deterrent. Opponents of the oil pipeline say they believe the company deliberately sought to destroy the artifacts, which are located along a two-mile stretch west of Lake Oahe. 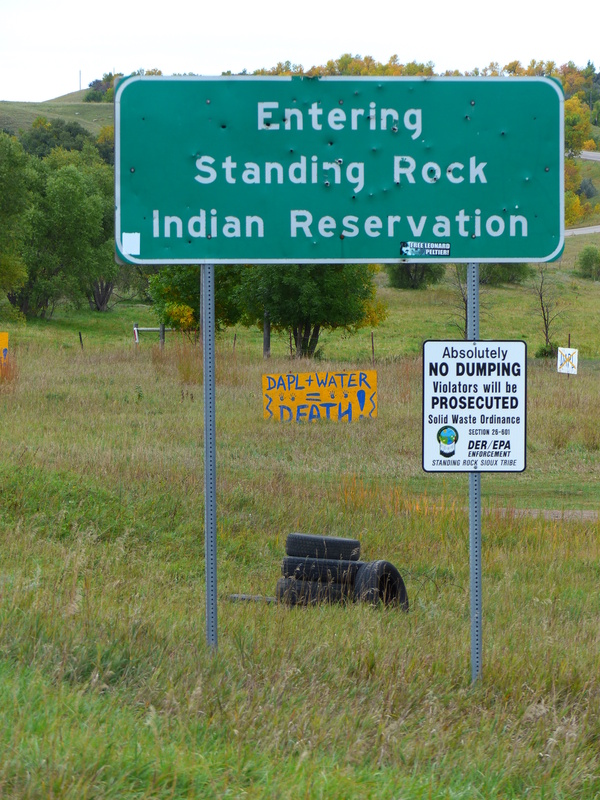 Dakota Access … began bulldozing that area on Saturday—less than 24 hours after the tribe filed a court document detailing the 27 graves, 16 stone rings, 19 effigies and other artifacts found there. By Sunday, all of those sites had been destroyed or harmed, according to court filings. The digging provoked a clash between water protectors and police. The October incident that sparked the $15,000 fine appears to be a separate episode, thought to be honest I am not clear on whether the two are related. Meanwhile, in western North Dakota, a gas company faces a much larger fine. Slawson Exploration Co. has agreed to pay a $2.1 million fine for the excessive air pollution it has released from 170 oil and gas wells in the state, according to a Dec. 1 story in the Bismarck Tribune. Importantly, the story notes that the wells in question are primarily on the Fort Berthold Indian Reservation. Again, it seems Native Americans are bearing a disproportionate environmental burden for North Dakota’s fossil fuel industry. Here is a “Dakota Access Pipeline Fight – By the Numbers,” a Fact Sheet developed by Inside Climate News. It provides an easy to digest summary of some of the key DAPL issues. Thank you for contacting me about the Dakota Access Pipeline and the impact that the pipeline has on the Standing Rock Sioux. I appreciate hearing your thoughts on this important issue. On December 4, 2016, the U.S. Army Corps of Engineers announced that it will conduct an Environmental Impact Statement examining alternate routes for the Dakota Access Pipeline, with opportunities for full public input and analysis. This decision followed months of intensive review and consultations between the Army Corps of Engineers, tribal leaders, and other stakeholders in the project. Following the announcement, Standing Rock Sioux Chairman David Archambault II asked that protestors camped near the Standing Rock Sioux Reservation return home. Again, thank you for taking the time to contact me. I continue to be humbled to be your Senator, and one of the most important parts of my job is listening to the people of Minnesota. I am here in our nation’s capital to do the public’s business. I hope you will contact me again about matters of concern to you. If it be said that the savages are unreasonable, we answer, that if civilized they might be reasonable. … If it be said that because they are savages they should be exterminated, we answer that, aside from the humanity of the suggestion, it will prove exceedingly difficult, and if money considerations are permitted to weigh, it costs less to civilize than to kill. First I ever heard of the Indian Peace Commission. Thank you. The same causes and effects apply, of course to US aggression in the Middle East and elsewhere….